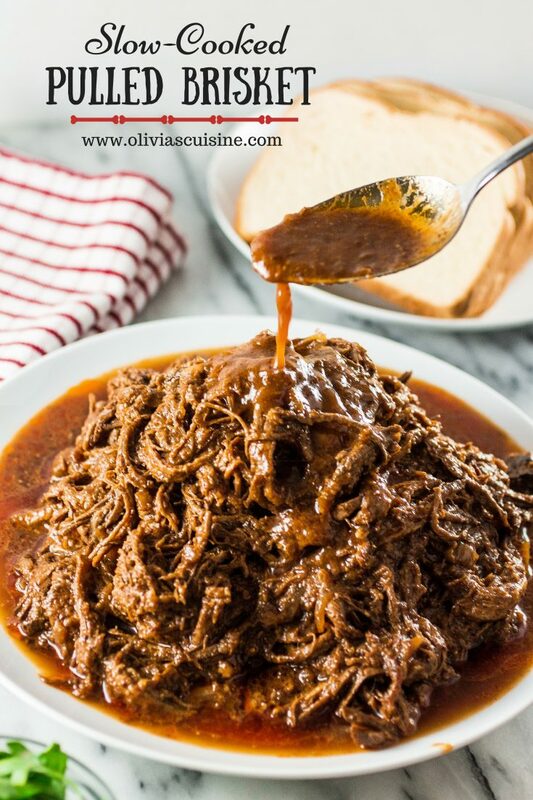 Yes, this has been a very meaty week at the blog, first with the Skirt Steak Fajitas and now with this scrumptious Slow-Cooked Pulled Brisket that will rock your world! I sincerely apologize if you’re vegetarian/vegan! I promise I have some delicious non-meat recipes on the work for you. But for now, let me focus on my carnivore friends! The truth is… I’m sharing this recipe with you today because I have an even better (whaaaat?!? What can be better than this?) 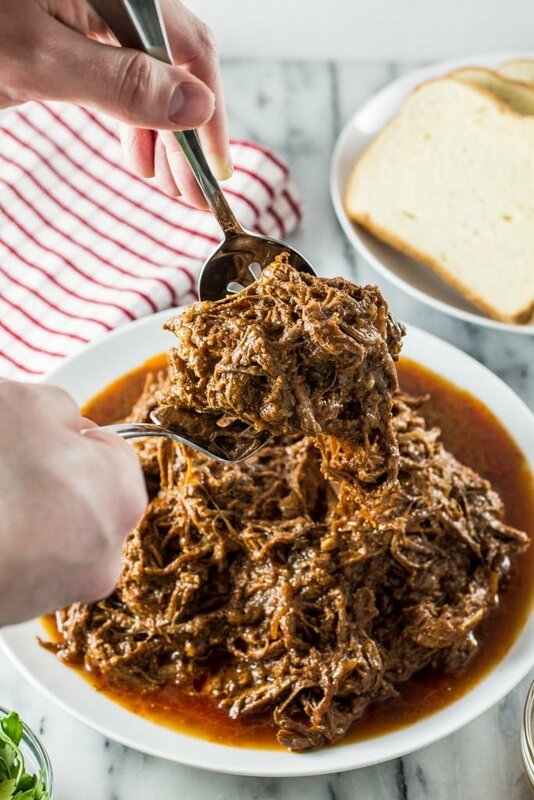 recipe coming later this week, that will need this pulled beef as an ingredient. 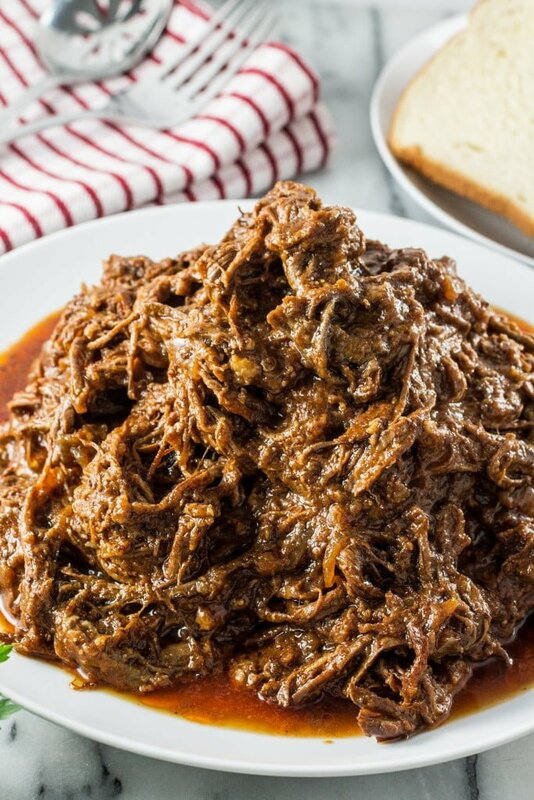 So I decided to share this Slow-Cooked Pulled Beef first because you will need to use the slow cooker, even though we run the risk of you eating it all even before I share the second recipe. 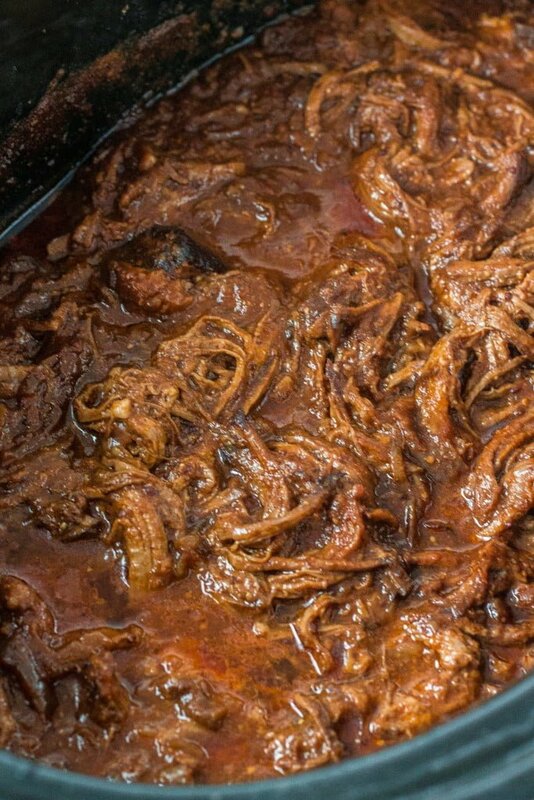 I need to confess something: until I tried pulled brisket, I hated brisket! The one I tried before was dry and super fatty, definitely not my type of beef. However, when brisket is slow cooked for a long period of time, the connective tissue’s fibers are broken down and the meat will fall apart at the touch of a fork. To prevent the meat from drying out during the cooking process, just keep the fat. I know, it’s gross! I have this horror-movie like aversion to big layers of fat, but I braved through it and left the fat in. At the end, once the brisket was cooked, I cut it out easily with a serrated knife and discarded the fat (against my husband plead to let him eat it!). You can tots (that’s ‘cool speaking’ for totally!) leave the fat in if it doesn’t bother you. I know of a few family members – ahem, dad… – that loves a good slab of pure fat. Nowadays he tries to eat it fast so I don’t see it, cause he knows I’ll forbid him! Doesn’t it look out of this world? And the flavor… oh, the flavor! The brisket soaks up all the flavors from the homemade BBQ sauce it’s cooked in. I guarantee you will be licking your fingers! This is perfect for weeknight meals or if you need a recipe to feed a crowd! You can serve on burger buns, on mashed potatoes, polenta, baked potatoes or you can wait ’til Friday for an amazing new recipe! Season the brisket generously with salt and pepper. In a large cast iron skillet, over medium high heat, heat the olive oil and, once smoking hot, brown the brisket on all sides until golden brown. Transfer the browned brisket to your slow cooker, fat side up. Back in the skillet, lower the heat to medium low and add some more olive oil if necessary. Add the onions and garlic and sauté for about 10 minutes or until the onions have caramelized. Transfer to the slow cooker. In a medium sized bowl, combine the blended tomatoes, the Worcestershire sauce, the vinegar, the mustard, the brown sugar, the ketchup and the chili powder, whisking everything together until smooth. Pour the sauce into the brisket in the slow cooker. Finally, add a whole chipotle pepper to the slow cooker and cover. Cook on low for 9 hours, until the brisket is fork tender. 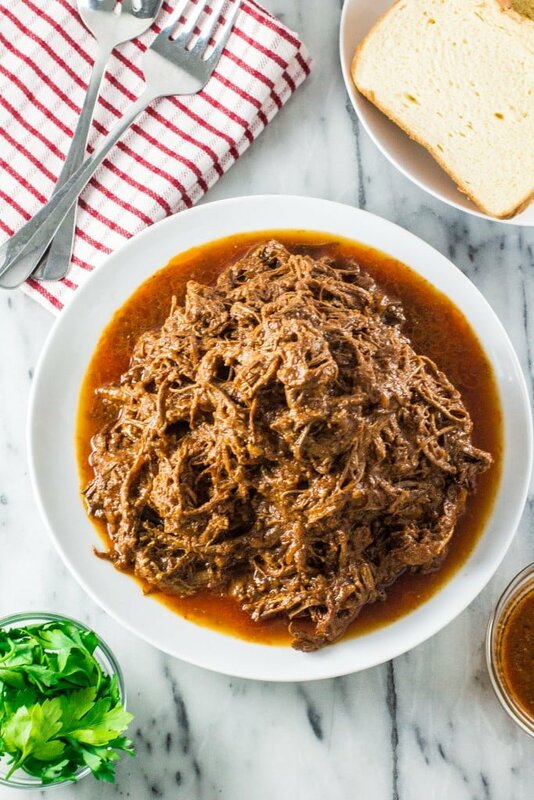 Discard the chipotle pepper and take the brisket out of the slow cooker. On a cutting board, take the fat out using a serrated knife. Discard the fat. Shred the brisket using two forks and bring it back to the slow cooker. Cover and cook for one more hour. Serve hot with buns or mashed potatoes. If you don't have a slow cooker, just braise your brisket in a dutch oven in the oven (300F degrees) for 3 to 4 hours! This brisket looks fantastic, Olivia! I’ve never made this in my slow cooker before, so I can’t wait to try it out. I love how tender this looks! love slow cooker cooking! lol! certainly “shock-if-opened-while-cooking slow-cooker lid is a fantastic idea! It will work great in my home too! Lol! Let’s create one and become rich! This looks like my kind of meal, easy to prep and walk away from. I can’t wait to see what recipe you come up with using the beef! I love brisket! How clever of you to use the slow cooker! We usually do it on the smoker and it takes about 30 hours! Yours looks amazing and I can’t wait to see what else you do with it! Fantastic beef recipe, must be packed with flavour. I’d like mine with mashed potatoes, please! This brisket looks amazing! I can’t even imagine would could possibly make this any better! This looks amazing! We were actually thinking of making brisket tacos tonight. Perfect timing! Hi Celica. Oops! I guess I forgot to add “cup”. It should be 1/2 cup! :) Thanks for bringing it to my attention! ♥ Fixing it now. Is it the whole can of chipotle peppers you add to the recipe or just 1 pepper. I tried this for the first time for the fourth of july holiday weekend and this is definitely a keeper. This was hero’d as a “celebration of the meat” at the dinner table today because the bbq sauce did not overwhelm the meat, but instead enhanced the flavor of the meat itself. Indeed, the bbq is more of a bbq marinade. I followed the recipe exactly except that I added three chipotle peppers to the slow cooker vs. one. After the 9 hour slow-cook, I added a heaping tablespoon more of the brown sugar. This created the perfect balance of hot and sweet to make this a winner. And the brisket really does melt in your mouth! Way to go! Chipotle in adobo is quite hard to find in the UK. Do you have any recommendations for an alternative? This recipe is outstanding. I made this dish to serve at a baby shower for 50 people and they inhaled it. I did it a little differently but still your recipe. I smoked my whole brisket in my smoker then transferred it (after shredding it) to slow cooker to braise in your sauce. There was an executive chef at the party for a big restaurant in Houston and he said it was hands down one of the best shredded beef dishes he’s ever had. I was wondering Sam if you put a rub on the brisket before you smoked it. I plan to make this recipe like you did. Any suggestions would be appreciated. I have just finished putting all the ingredients in my slow cooker, now if I can just leave it alone for 9 hours… Cannot wait to taste this! Can I use a corned beef brisket? Curious if im using a roater what would the temp be at? Has anyone tried making this the day before and re-heating?